Rigid pavements are high stiffness pavement with the main structural layer is plain cement concrete. Because of high stiffness in contrast to flexible pavement the deformation of the underlying layer to the concrete layer that may appear in not reflected the pavement surface. However, after a certain period, a surface crack may appear on the concrete slab. Basically, a rigid pavement consists of a PCC layer and a subset layer. in some of the cases, Asphalt layer is used over the continuously reinforced concrete layer. Studies have shown that with an Asphalt layer no top can provide a long life with other advantages such as noise reducing properties. The base difference between unreinforced jointed reinforced and continuously reinforced in first two joints are constructed also the longitudinal direction or construction joints. whereas transverse joints are not provided in case of continuously reinforced. In this Jointed plain cement concrete Pavement, there is no reinforcement bar for load transfer. However, Reinforcement tie bar often provided to give a base a hinge effect at longitudinal joints to prevent joints opening or edge opening. These kinds of Road pavements are generally used on low traffic volume highways or where cement stabilised soils are used as a sub base. In this type of Concrete, Pavement joints are provided at shorter span such as 10 feet or 20 feet distance. It also helps surface to prevent concrete surface cracking. In some cases, joints are provided after 4 to 5 feet so only one wheel of a vehicle passes through the joint at a time. It also helps a smooth ride experience. 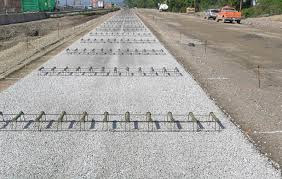 JRCP or Jointed reinforced cement pavement have dowels for the transfer of the complete traffic load across the joints, generally distance for joints ranging from 30 to 90 feet. Reinforcement steel bars is used throughout the concrete slab, whereas amount of steel dependent on the length of the concrete slab. Generally, Tie bars also are used commonly at longitudinal joints. It is also known as CRCP, it does not have transverse joints, expect the construction joints or expansion joints. These construction joints provided at specific position such as bridges. In this concrete pavements, high reinforcement is used minimum usually at 0.6 percentage of the cross section of the slab. They also contain tie bars across the longitudinal joints. The Continuously Reinforced concrete pavement with Asphalt Surfacing layer thickness ranges from 30mm to 100mm. This is also known as Rigid Pavement with continuously reinforced concrete base and Asphalt layer.